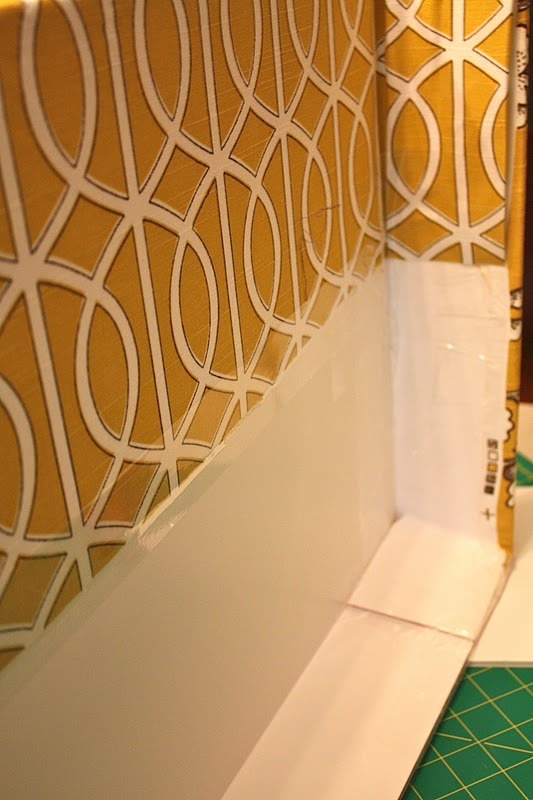 MONDAY MAKEOVER – The EASY as PIE Cornice/Pelmet Tutorial REVISITED!!! and I am embarking on another DIY journey. To make something beautiful, simple and most importantly…fast! The supplies you will need this time are easy..
so, that means… you will need 2 packs total. 6. and batting to line the Cornice. I could not find my staple gun so I ended up using Packing Tape for the whole thing! First, measure your window width and then add 9″, and this is why. You will need 3 1/2″ on either side to be the SIDES and one extra inch on either side to set the Cornice out from the window frame. (You will need to adjust YOUR personal measurements if you want your Cornice Shallower or narrower or wider. Now, Take your board, (I just used the exact size of the board 20″ x 30″ (NO cutting!) and I cut the second board so that the EQUALED the measured length I needed. I did not know where my staple gun was and took a break and ran to the grocery store and got packing tape. I had also discovered that I did not have enough fabric to cover the WHOLE piece so I pieced together a coordinating DWELL STUDIO Fabric, and created a lining. Okay…are you ready for the REVEAL??? 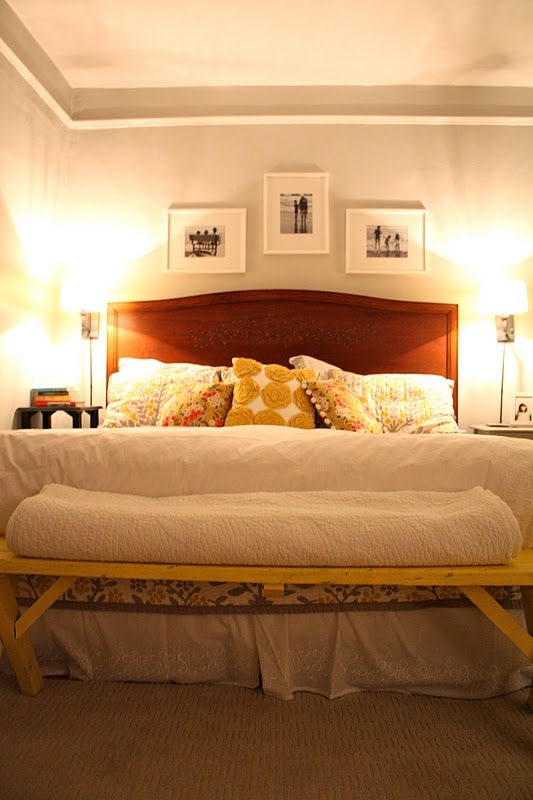 lets just go ahead and take a Bedroom tour…First I had to make the bed! on my “to do” list is to make a cushion and upholster this bench. I am contemplating upholstering this headboard for one…. Do you have any fun projects lined up? What do you have on your windows? Hi Leslie! Thanks for stopping by my blog this morning and following me! I am honored to follow you right back! I have been looking around your site; and I love it! Many Blessings to you!! Very cute!! Thanks for stopping by and good luck with your blog! Thanks so much for this detailed tutorial. The results are gorgeous! I will definitely use it. We are currently searching for an old country-ish home (you can see the two we’ve looked at thus far on my blog). Yours is beautiful! Love it! This is going on my Pinboard! I’ve been looking for a simple way to make a cornice – this looks perfect and I’m going to Target tomorrow for my supplies! I already have my material and have been looking and looking for ideas but all seemed more complicated than necessary. Thanks! Absolutely LOVE these! Just wanted to let you know I featured these on my blog today, in an article about the many different types and techniques of “no-sew” window treatments. Thank you! Did these today for my little boy’s nursery! (his crib is dangerously close to the windows, so no drapes allowed.) These really spruce up the windows! What a great tutorial on pelmet boxes and your windows look gorgeous – your whole room is beautiful too! I’ve got this linked to my pelmet boxes post too today, well done! Oh my goodness I’m drooling over the chair in this room. Can you source it for me? Is it Dwell fabric? I’m loving that our styles are so similar and we both have very old homes. HI SARAH, yes this is a dwell studio fabric, in brindle, try fabric.com…great deals!!! This is a great step by step tutorial! Can’t wait to give it a try this weekend. Question – what keeps the box from falling down? It looks like its just resting on the curtain rod. Did you do something more to keep it in place? In this room, yes, I did tape to curtain rod inside and then hung it up. However, I recently took it down and just tapped nails in right along the top edge of the window moulding and set it upon the nails. I am so impressed!! Thank you for sharing this! I love this tutorial and I added a link to it at my new blog, 60 Pounds of Pancakes. I’ve made this three times! It’s easy to follow and great for us who are sewing machine challenged! Thanks! Thanks for the help with the Valance! I’m excited to try it! Also I don’t know where the staple gun went off to in our move so this makes your tutorial even better! 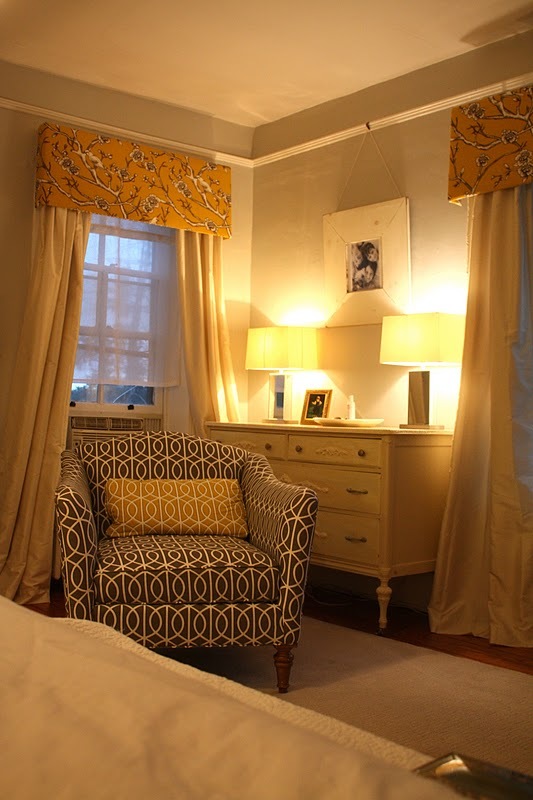 Is the yellow rosette pillow on the bed use Amy Butler Fabric or did you make each rosette? I’ve wanted to have this pillow for a while because it matches me bedroom! 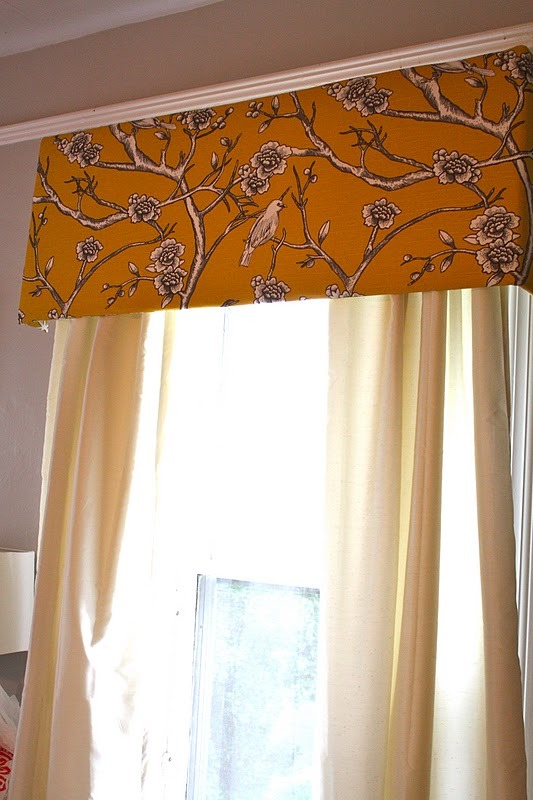 I’m in the middle of making this per your instructions and just have one question… My window width is 36″ across. So I measured 45 ” across foam board (to equal the 9 additional inches you recommended). Then drew a 3 1/2 inch border around all sides. Then I draw another line on the two sides an inch inside (towards side edge) OR outside (towards center) the 3 1/2 inch line already drawn? Just trying to make sure before I proceed. Thank you so much, this is such a great idea. Did you glue the rod down or does it stay on your own. I’m actually getting ready to do this for my daughters room and I’m looking for the safest most secure way of doing it. I installed the cornices with nails lined across the top of the window frame. Previous Post SATURDAY HIGHLIGHTS AND YOU too Love PINK!